The Lord of the Rings Online™ is the world's first and only MMOG based on the Books of J.R.R. Tolkien. Players can experience the most famous fantasy world of all time, exploring and adventuring their heroes through the vast reaches of Middle-earth in the fight against the forces of the Dark Lord Sauron. As your character advances and grows, customize it using Traits – interchangeable abilities which modify your character's skills to give you greater control over its specializations. Gain new Trait slots by leveling, and unlock new Traits by completing Accomplishments. 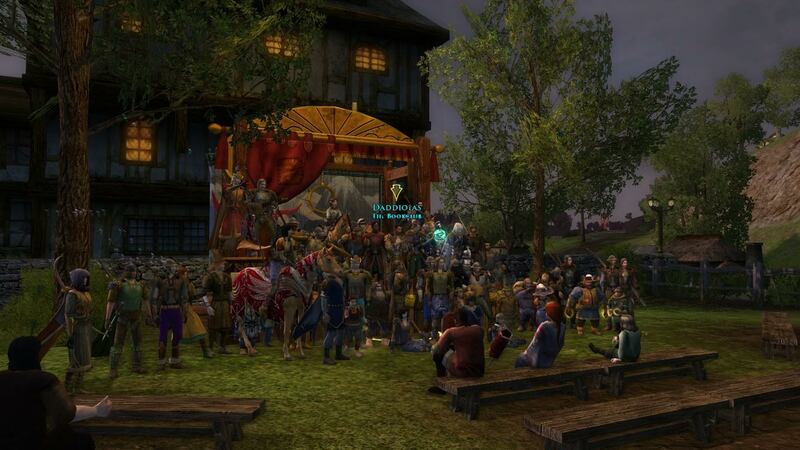 With hundreds of hours of gameplay, there's plenty to do in LOTRO as a solo player or in a fellowship. Follow the storyline on your own or form a fellowship with other players for epic battles against creatures like Orcs, Wights, and even Balrogs. Coordinated fellowships can use group combo moves to do incredible damage, heal their fellowship, or restore their energy – how they harness the power of a combo is entirely up to them to decide! LOTRO will also include a consensual Player vs. Player combat system (details forthcoming), allowing players to fight against each other for glory and honor! Farm in the Shire or forge weapons and armor in Thorin's Halls. Players can craft arms for the fight against the Dark Lord Sauron, or enjoy more peaceful activities like cooking and farming. Those who dedicate themselves to becoming master crafters can create legendary items of unsurpassed quality. LOTRO offers an expansive, open world, and incorporates cinematic technology to present the player with movie-like sequences which further the storyline. Experience epic challenges like the depths of the Great Barrow, the siege of Fornost and the battle to retake Weathertop. Meet and socialize with thousands of other players and fans of J.R.R. Tolkien's works. Relax at the Prancing Pony in Bree, the Green Dragon Inn in the Shire, or any of the many other social centers throughout the land. Express yourself through emotes and chat – wave hello, bow, or dance with a friend! Experience an epic storyline through hundreds of quests created as a companion to The Lord of the Rings. Adventure in familiar areas as well as new ones, created for the game, which were only briefly touched on by J.R.R. Tolkien in his master works. Experience Middle-earth as never before as you swim the Brandywine River or make your way through the mists of the Old Forest. Turbine, working closely with Tolkien Enterprises, has created what Gamedaily calls "...a must have title for fans of Tolkien lore."